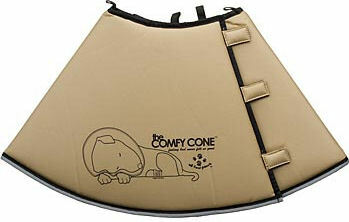 Why put your pet in a hard plastic lampshade when there’s the new Comfy Cone surgical recovery and protective cone? It helps prevent licking, biting, scratching and pulling stitches out of wounds. Use for hot spots, allergies, post-surgery and any time you need to protect your pet. Hard plastic cones from the vet can cause insecurity, confusion and frustration in your pet. This soft cone alternative lets your dog sleep, eat and use the doggy door comfortably. It’s better than a hard plastic e-collar because it’s comfy! 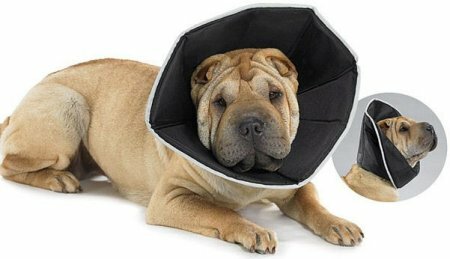 As seen on Animal Planet, the Comfy Cone allows your dog to sleep and eat in a normal position during post surgery recovery. No more bumping into the walls or carpets (or your legs – ouch!) and getting hit in the throat. No more pushing the doggie dish across the floor, trying to eat or drink. No more stress from not being able to see. No more running smack into the doggie door. The Comfy Cone is comfortable, washable and flexible. Just as effective as a plastic cone, but made of fabric. Folds back if needed so you can adjust the length, increase your dog’s visibility, assist with mealtimes or allow you to examine your dog. Try that with a hard plastic cone! Owners of Corgis, Bassets and Dachshunds will especially appreciate this feature. Perfect for incision protection after abdominal surgery, spay/neuter surgery, or any post op recovery. Attaches with Velcro, which is fastened all along the seam. This allows you to not only get a very comfortable, custom fit, but it also allows you to adjust how wide you want the open end to be. 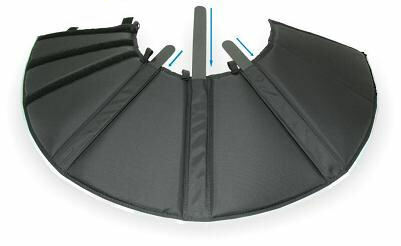 Change easily from a wider cone to a more narrow tube-like shape, depending on what your dog needs. Is your dog’s measurement between two sizes? Then figure out which size you need based on the location of the area you’re trying to protect. If it’s on the body (chest, neck, back, hip, stomach), order the smaller size to give your dog the most visibility. If it’s on the tail, paws, legs, or eye, choose the next size up, which will be longer on the sides. A dog with a 14 cm neck who’s just been spayed would want a small. A dog with an 25 cm neck with a paw injury would want an large. Measure your dog’s neck at the base of the neck. Made of durable ripstop nylon. Elastic loops so you can slip your dog’s collar through – helps it stay on. Thin foam inside – keeps collar’s shape without being hard. Velcro closure for greatest range of adjustment. Reflective trim around edge for safety.